How many TRILLIONS have been wasted on this garbage for the sake of lining the pockets of banksters, and insiders like Al Gore and Tim Flannery? Interesting BI ……. and good that you have found what appears to be a reliable source without vested interests this time. I did a quick search for Judith Curry and she has so far come up ok so what she has to say is worth reading. Whilst the Mail on Sunday is probably as reliable as the Telegraph in Australia I must admit that Curry’s report needs further work to see if it is flawed or not and this will without doubt be happening. Whilst I am unaware of what is happening in the oceans it does seem bizarre that the air temperatures are setting new records every year. The Northwest passage was featured in a Billy Connolly documentary recently and it looked quite open with the narration that it has been open for years, supposedly meaning that it is not routinely frozen over. In the end we will see where this is going but making the conclusion that all of the other (measured) evidence can now be discarded is not in the mix. As they say one swallow doth not a summer make. While Curry may have been the scientist most prominently referenced in this particular article, that does not mean she is the only scientist arguing the same / similar view. Something to bear in mind. Global climate change is only the most recent example of sixty-eight years (2013 – 1945 = 68 yrs) of government deception intended to prevent nuclear annihilation by establishing the present Orwellian, one-world government. That is a synopsis of more detailed information sent to the Congressional Space Science and Technology Committee last month. The global warming agenda has been proved to be based on deception – depending on the ignorance/gullibility or bias towards a political agenda of the populace. Some, such as the ABC would argue that supposedly record high winter temperatures on the southeastern coast of Australia constitutes global warming. NE of the most shocking scientific realizations of all time has slowly been dawning on us: the earth’s climate does great flip-flops every few thousand years, and with breathtaking speed. We could go back to ice-age temperatures within a decade — and judging from recent discoveries, an abrupt cooling could be triggered by our current global-warming trend. 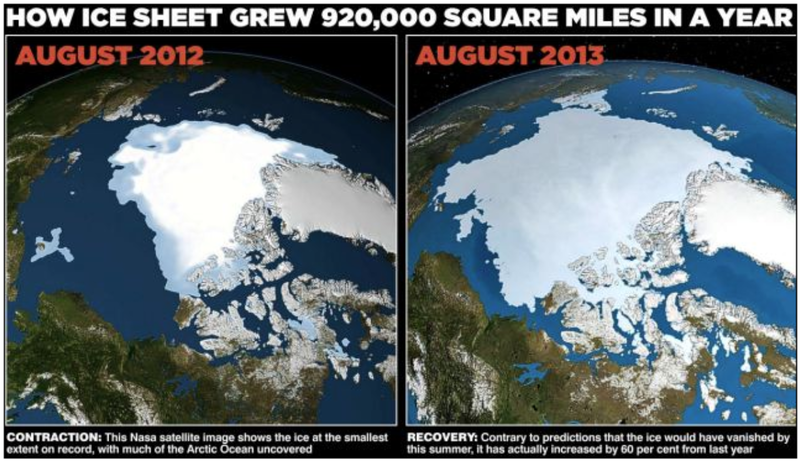 Europe’s climate could become more like Siberia’s. Because such a cooling would occur too quickly for us to make readjustments in agricultural productivity and supply, it would be a potentially civilization-shattering affair, likely to cause an unprecedented population crash. What paleoclimate and oceanography researchers know of the mechanisms underlying such a climate flip suggests that global warming could start one in several different ways. For a quarter century global-warming theorists have predicted that climate creep is going to occur and that we need to prevent greenhouse gases from warming things up, thereby raising the sea level, destroying habitats, intensifying storms, and forcing agricultural rearrangements. Now we know — and from an entirely different group of scientists exploring separate lines of reasoning and data — that the most catastrophic result of global warming could be an abrupt cooling. new “science” to guilt trip and scare monger their populations into smaller and more conservatives forms of living. In other words, they coasted them into the poverty that the greed and treason of those said same elites was already creating in their native lands. Well sea ice comes and goes, first noticed in 1957 when the Americans used a nuclear sub to negotiate under the ice cover, and the blue patches were rare. But they noticed little sea life existed where the ice had been because of a layer of fresh water didn’t support them. 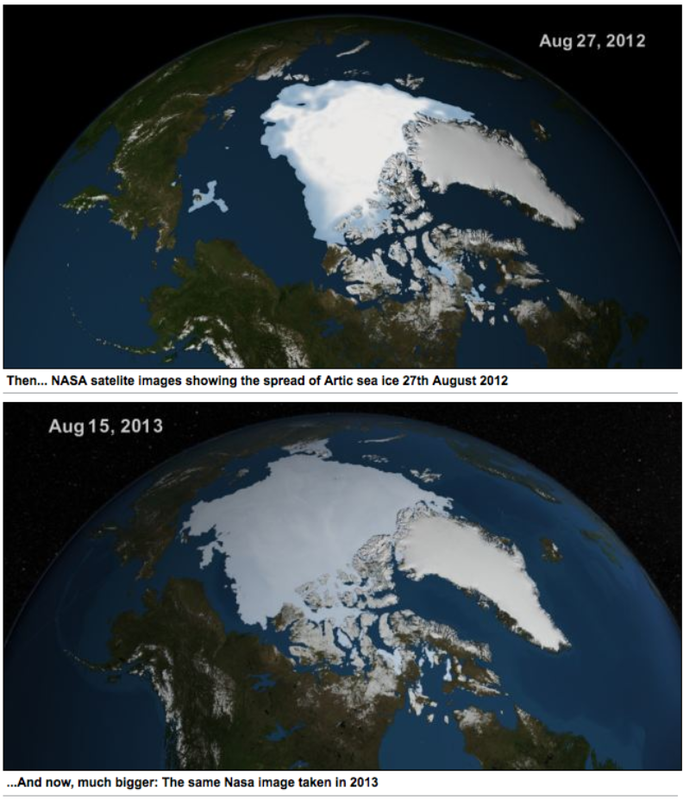 To blame sea ice melting on global warming is risky, as sea ice melts and recovers all the time. And the arctic has no land at the poles, unlike the antarctic. It just is a scam for the bankers and traders in carbon credits. And those third world countries who hope to gain from the 660 million Australia gives to the UN Climate change fund hoping to pay for it from the carbon tax.